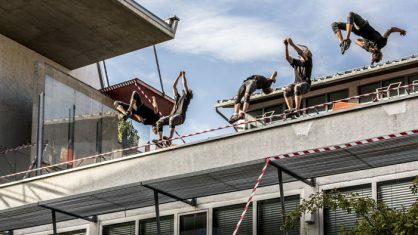 The free-runners of the French troupe La Fabrique Royale fly from roof to roof, overcoming gravity apparently effortlessly. But Zéro Degré is more than a spectacular acrobatic performance. In combination with sounds, director Franklin Roulot develops an artistic language that plunges everyday surroundings into a completely new perspective. Here it isn’t just about how towns are built, but also how people live there together. A La Strada-coproduction with the international streetart-network IN SITU. A preview of the Zéro Degré project will be held at MURPARK at 11 a.m. on 26 July. The director Franklin Roulot will tell the audience more about the background and the development of the IN SITU project. The project was developed in various residencies throughout Europe, including a residency during La Strada 2017, after which Franklin Roulot will answer questions from the audience and the freerunners will explore the site in a short tryout. the French Freerun Family : Maxence DE SCHROODER, Simon NOGUEIRA, Johan TONNOIR, Anthony DEMEIRE and Benjamin CANTE. Production : La Fabrique Royale. Lieux publics – Centre national de création en spectacle vivant, Marseille // Théâtre de l’Avant Scène – ville de Colombes // La Verrerie d’Alès – Pôle National Cirque Occitanie // La Strada – Graz. With the support of : European In-Situ Platform for Artistic Creation in Public Space // CNC // DGCA // Île-de-France region // ADAMI. Frederic REMY (Scènes de Rue), Jean Ju Bonzom, Julie TAVERT, Karim RANDE, Maxime REYDEL, Jonathan DUMONT, Jeson GALLET, Andrea CATOZZI, Emmanuelle PY (Production help), teams of the Furies Festival, the city of Montpellier, Alexandre and teams of the National Theatre of Bruxelles, and to everyone that goes through frontiers.